On Sunday I awoke dehydrated after 5.5 hours’ sleep (I’d been in a cocktail bar in Manchester till after midnight). Not the best pre-race regime, but I didn’t want to have to sacrifice my Saturday for a 10k road race on the Sunday morning. I ate a couple of packs of microwavable porridge – I keep these for when I’m travelling to events; they’re a great backup if the hotel/B&B/hostel doesn’t have suitable breakfasts at the right time. On the Sunday, I just lacked any other food in my cupboard! I drove to Liverpool for the Born To Run (BTR) Tunnel Run 2013. I was still getting over a knee injury so wasn’t feeling 100%, but I knew that it’d all be over in under an hour so I wasn’t stressing too much. The starting area wasn’t too impressive – runners were corralled between sets of barriers behind a start line and the starter horn tooted unenthusiastically at 9.30am sharp. I started in the middle of the pack with friends but then focused on moving forward through the field. The first part of the race was on back roads in Liverpool – there was a lot of road furniture (curbs, signage, bollards, etc) in the way and I was sure someone would trip up as the width of the route varied along different roads and paths. Eventually we looped to the top of a service entrance and into the Kingsway Tunnel. The tunnel was wide and choruses of “Oggy Oggy Oggy” reverberated through it as runners accelerated downhill. I’m pretty nimble on the downhill so I cleared a large number of runners ahead of me, with only a couple of guys overtaking me in turn. 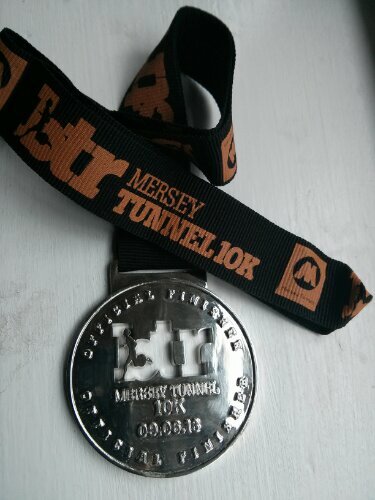 The tunnel was definitely the highlight of this run, and worth doing just for the experience of running under the Mersey. On the eventual uphill out of the tunnel I ignored all the other runners around me and focused on my pacing. I’ve done a lot of hill interval training this year and it paid off as I kept an aggressive pace out of the tunnel and back into the sunshine. The next couple of kilometres led us along flat roads to the promenade on the south side of the Mersey, before a long stretch of 2 kilometres along the promenade to the blue finish banner visible in the distance. For some reason, despite having listened to fast paced music in the morning, the song that stuck in my head on loop as I ran was “Hurt” by Johnny Cash. Fortunately I wasn’t hurting too much; I managed to keep a good pace and accelerate progressively to the finish, with a well timed thunderous sprint over the finish line. The result – a new personal best!